Finding a perfect bag isn’t easy. Moreover, finding a bag that you can take to work, to parties, to business meetings, as well as to casual gatherings is even trickier. Still, once you do encounter such a versatile bag, you’ll realize just how convenient and useful it is. That’s why it’s important to keep looking. Also, a good bag needs to be long-lasting. If you finally find one that ticks all the boxes, but it’s of poor quality, you haven’t solved the problem. What’s the point of a pretty bag that will only last for a couple of months? Instead, focus on searching for a high-quality item that you’ll be able to carry day after day, for years. Such bags can seem expensive at first, but think about it like this — all you need to do is invest in a good bag now, and you’ll be set for years. 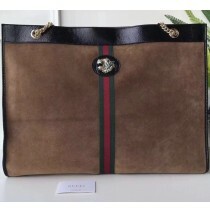 This Gucci bag is all you’ll ever need; it’s fancy, it’s modern, it’s versatile, and it’s durable. Plus, the tiger head makes it particularly unique. The brown suede has been trimmed in black patent leather and enhanced by the red and green web inlay in the front. The hardware is shiny and gold-toned, and there’s a tiger head with crystals that has been inspired by a vintage jewelry design by Hattie Carnegie. Furthermore, double chain straps with leather detail have a 10” drop, there’s a magnetic closure and a detachable pouch with a zippered closure. When it comes to size, the Rajah is 17 in x 14 in x 2.5 in, which makes it ideal for everyday use. Plus, you can put this beauty on your shoulder or you can wear it as a top handle bag — choose whatever you like better. Once you get this Gucci piece in your hands, you’ll quickly realize what’s so special about it. Apart from looking amazing, this bag is quite practical. Also, it’s made of high-quality materials, which means that it will last for a very long time.